In their highly recommended book "Outstanding Teaching: Engaging Learners", Mark Burns and Andy Griffith set out a number of techniques for tapping into the holy grail of engagement: intrinsic motivation. Using foam dice (they do need to be foam or the activity quickly becomes too noisy) and a 6 x 6 grid of stimuli, a random element is introduced to the way learners interact with content. It can be particularly helpful with writing / creativity. This example (encouraging learners to explore writing in the Gothic Horror genre) is fairly typical. Learners use dice to land on squares in the grid such as "Lost!" or an image of an egg timer, then attempt to write a sentence inspired by / including the content of the grid square. Learners work in pairs and swapping the pen after each sentence. One way to narrow the gaps? Get rid of your Low Ability learners. "Surely, you can't be serious!" I hear you cry, dear reader. And whilst you are about it, get rid of your High Ability, Middle Ability, More Able and Gifted & Talented learners too. "But there'll be no one left to teach!" you retort. Yes, there will: and they will be learners who are - every single one of them - growing in confidence in your classroom. 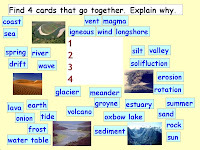 To produce this activity you need do nothing more than type a list of key words (and maybe a few pictures) in separate text boxes on the interactive whiteboard (paper cards with blu-tac on the back are also fine). Despite its simplicity, this is one of the most powerful techniques for probing understanding and revealing misconceptions that I have come across. 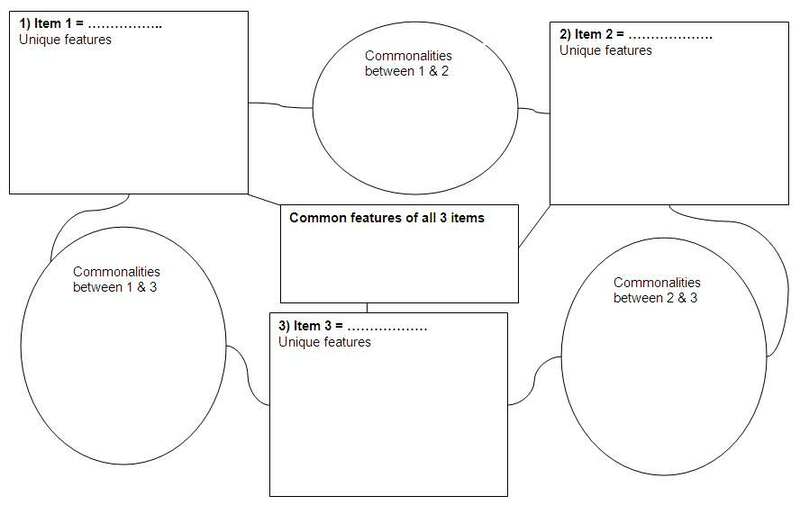 There are many ways of running continuum activities but in essence they involve learners sorting information according to a specified criterion. For example, you might give learners different cards with statements such as "Owning a computer"; "Having lots of friends"; "Having lots of money"; "Being loved"; "Knowing a lot"; "Having a degree"; "Driving a big car"; "Wearing the latest trainers" etc. The criterion is this case might be "What are the most important factors that contribute to a good quality of life?" Learners then need to sort themselves according to this criterion, and hence justify their position on the continuum. This generates a lot of discussion and - depending on the context - this can get quite heated! Mysteries can be extremely engaging, powerful thinking skills activities. They involve giving small groups of learners a set of cards containing many different pieces of information and challenging them to answer a Focus Question by sorting, connecting and making sense of the information. The mystery can be convergent (there is one right answer - like in this maths example: "Does Amelie make it to the catwalk? "), or divergent (there are a number of ways learners can connect the information and draw different conclusions - like in some of these History examples). Opinion Finder is a great way to actively involve learners in seeking out and listening to the opinions of others. 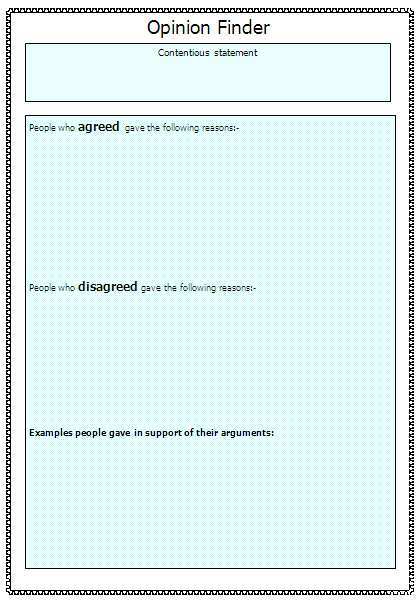 Each pupil is given a proforma sheet with a contentious statement on it, that is relevant to the topic at hand e.g. "Using cannabis is less harmful than drinking alcohol", "Goldilocks was a brave girl", "Lady Macbeth was evil", "People should be able to vote from age 16", "The grid method is best for multiplying two 3-digit numbers" etc. Learners then move around the room asking each other if they agree with the statement or not, and WHY. They take notes of the different opinions. Not every activity has to be a brain-bending thinking skills challenge. 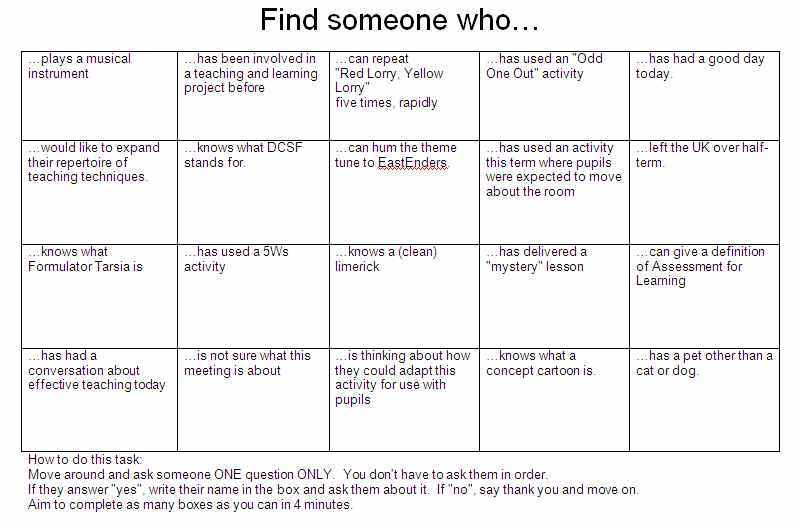 This is a simple, fun ice-breaker perhaps best used at the start of a year so learners can start to find out a bit more about each other. 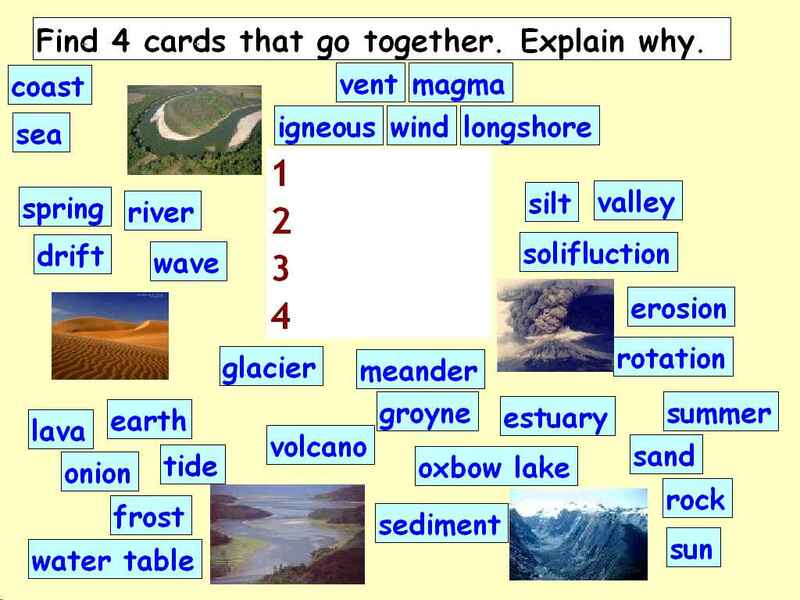 A way of doing a card sort, thinking skills activity but without having to prepare any cards! LIST: Invite students in small groups to write down as many words / phrases as they can that are connected with a particular concept (e.g. 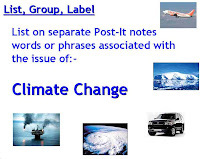 climate change) and write them on separate Post-it notes. The more they come up with the better (use the really small post-its to save paper). GROUP: Ask the students to think how they could sort the post-its into groups that have something in common. Do not suggest categories - the value lies in them making the connections themselves. This is a technique that encourages learners to look in real detail at...well, anything! And it's such a simple way to encourage skills around classification, categorisation and making links. - What do items 1&2 have in common? - What do items 2&3 have in common? - What do items 1&3 have in common? - What do all three have in common? - What is unique about each item? This technique can be used as a starter or recap activity and takes little or no preparation. 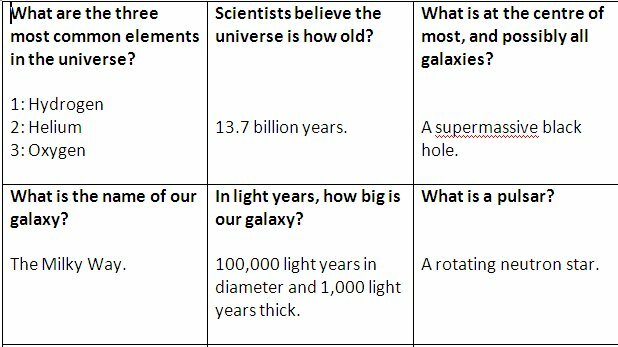 Invite students to come up with key words from your subject. Type / write them randomly all over the whiteboard. Around 12-15 is a good number. Next invite two students to stand on either side of the board. Now ask a student from the rest of the class to ask a question, or give a definition the answer to which is one of the words on the board. The two students at the board then compete to Splat the correct word with their hand / a fly swat / a rolled up newspaper.